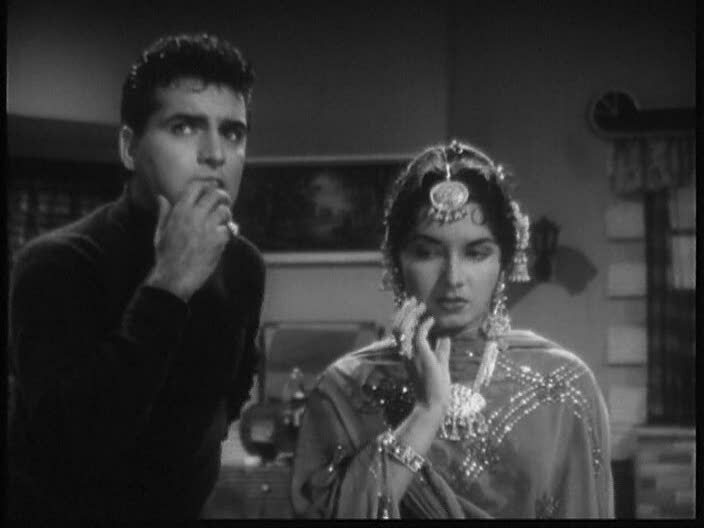 Based on the plot, Reporter Raju is a mystery, a sort of scaled-down North by Northwest, as Raju (Feroz Khan) is suspected of a murder he didn't commit (though he did touch the murder weapon with his bare hands, as all first-rate journalists would) just after being given a mysterious clue to/lead about another dangerous situation, leading him on flight from the police (Madan, his sister's fiancé, is the lead officer, wouldn't you know [and played by someone utterly uncharismatic - who was that?]) and on the trailer of the real killer while avoiding the real killer's goons and racing to prevent the danger he has been told about. But once you factor in the music, pacing, and tone of performances - and a stop at his ailing mother's house! What? This is a Hindi film! - it's pretty easy to lose any plot-generated conceptual or emotional tension. It's a fun enough movie, but it did not really cohere for me, and it certainly did not suspend me, so to speak. The story was interesting, but it's very easy to predict what isn't going to happen, who isn't going to get bumped off. 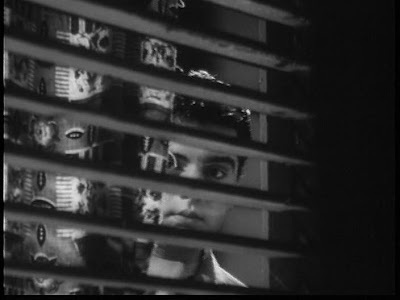 This is my first Wadia Brothers film, and from what I have read and been told about them, I think the background score from one of their other films got mixed up with what should have accompanied this 1962 thriller-ish project. If you just listened to this movie (minus dialogue), you could easily think you were watching a matinee caper featuring horses and masked avengers - something more stunt-y and circus-y. It's great music, but to me it sounded decidedly lighter than the plot elements of murders, secrets, a journalist on the run, and a mysterious man missing part of a finger would suggest. I also found the style of dialogue delivery out of character with the plot. I don't know the term for this, but I felt like I was watching a very earnest but unsophisticated local theatrical production, you know what I mean? The editor mixed action scenes with shots people rushing towards something, then suddenly stopping to stand stock-still and mute. There are some plot holes, as though someone forgot some lines. There's something stagey about some of the performances - a little bit shout-y, a few too many pauses. I thought these detracted from the pacing of the story, which is definitely part comedy and romance as well as suspense, but they inhibited the development of any real tension in the story. Feroz Khan refusing to show much other than self-satisfaction in his facial expressions didn't help either. It's hard to feel any suspense when your lead swaggers when he ought to be uncertain. Watching Feroz swagger is of course a good time, of course and partly why I rented this movie), but it didn't suit what Raju was going through as often as was depicted. A notable exception is a nervous near-encounter between Raju, the unknown woman whose path he keeps crossing (Chitra), and Madan on a moving train and a high bridge over a river. Many aspects of this film are just a little bit off - but nothing unforgivable or disastrous. If they were going for "fun" rather than "tautly suspenseful taut," then they succeeded. Memsaab has written this up, and she has pointed out everything that I would say, so given that I have a cold, I hope you will forgive me just sending you her way for a taste of the plot and overall look. I agree with her that the actual songs are really great, especially the feminist qawwali and final big stage number, which is in lurching, über-pastel, but still exciting color (the rest of the film is black and white) and has lovely lyrics about the thrill of the romantic atmosphere of the night (according to the subtitles, anyway). There are some visually interesting shots of waterfalls, bridges, and people hiding as they eavesdrop on their pursuers. Feroz jumps out a lot of windows, and there are some other fun action sequences, as well as an acrobat performance. Feroz befriends the acrobats, and as he flees the police he encounters them several times, providing nice comic elements and what I thought (hoped) would be a really cute love story. 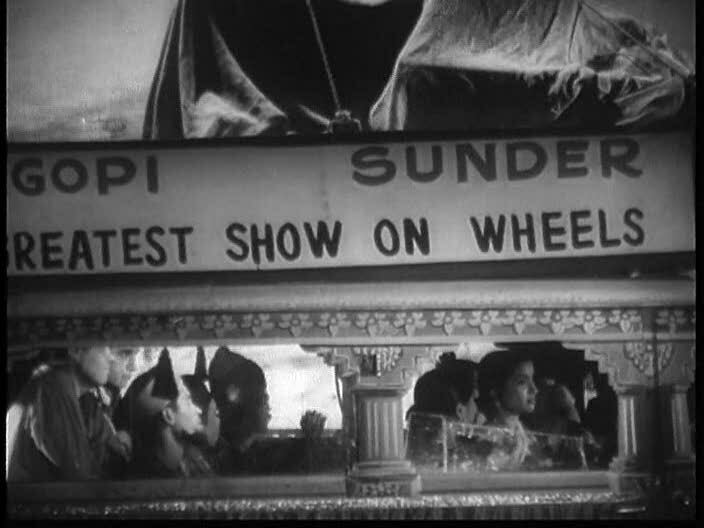 The subtitles of this Shemaroo disc merit their own discussion. As Memsaab says, at times they drop out, and at others they storm across scenes that have no dialogues. They also were just a little bit off in connotation quite a few times - as though they were mirroring the "not quite" inconsistencies I felt elsewhere - with word choices that didn't quite get at the meaning. 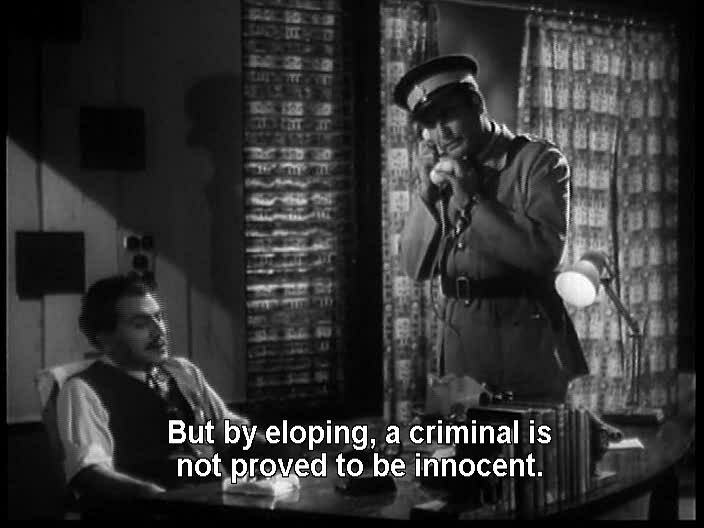 For example, here we see police talking about a criminal escaping, but the subtitles say "eloping." 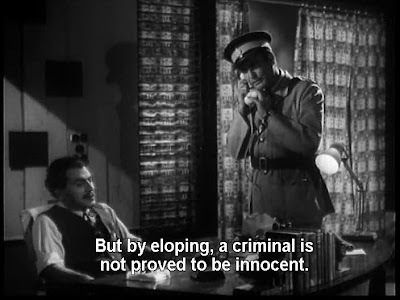 For all I know that's what the dialogue says too, but the criminal most definitely did not run off to get married. It's like the subtitle crew went crazy with the thesaurus, looking to tweak their first inclination into something more complicated or formal. Again, not a horrible downfall, but the words chosen did not flow, which in turn slowed down the pace a bit. Combined with all the other little stumbles, they prevented the film from working as well as it could have. 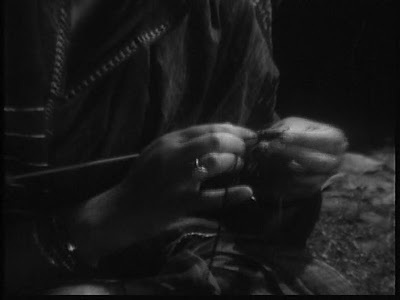 This knitter is the woman brutally knifed a few scenes later, perhaps presaged by her knitting needles? Hmmmm! Hi Beth, I love Bollywood movies, I have a little collection. Ive had this DVD for TWO YEARS and still havent seen it. Shame on me. But I have a feleing enxt month I will watch tons of movies, and with them, this.